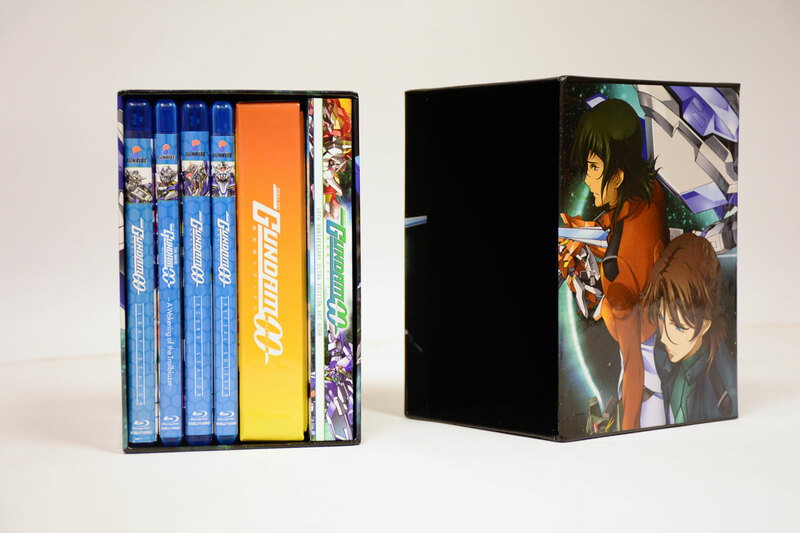 Mobile Suit Gundam 00 10th Anniversary Ultra Edition Blu-ray contains episodes 1-50, the A Wakening of the Trailblazer Movie, both OVA series, plus a 236-page hardback art book, 4 double-sided art cards, a fabric poster, a Haro metal keychain, a large car magnet and an amazing chipboard box! I love this show. I used to stay up and watch it on SYFY's animonday's. I know people give this Gundam series a lot of flack but It's definitely worth a watch. Just give it a chance. Honestly it's better than Iron Blooded Orphans. "We begin the intervention to all warfare with GUNDAM..."
Gundam 00, despite being a decade old, is still the best AU series of the 21st century. With a distinct post-9/11 flavor, it succeeded where SEED failed in being a truly next-generation Gundam series. Nothing else looks or sounds like Gundam 00, and while the second season is flawed at times, the total package is absolutely worth a watch. As one of my favorite series'. This was a must own. Couldn't have asked for a better collection of Gundam 00. Well worth the price. Not much of an "Ultra Edition"
(Rating my purchase on content and production rather than series itself.) If you plan to get all of the series Blu-ray collection this edition is worth it. But it it offers little to the Gundam 00 fan. Its little more than a nice box with arts cards and an artwork book. Would have loved to see a artwork book much like the Gundam Wing Ultra edition size rather than a small pocket sized book. Gundam 00 the series is a beautifully animated, engaging story. It's absolutely one of my favorites! The actual special edition doesn't include much extras on the blu-rays, which was a bit disappointing. If you're looking to get the series with a couple of fun added items, this is perfect. Solid collection for any Gundam 00 fan. Everything you can want is here. Was rather surprised at how extensive the art book that came with the package; I almost want a super-sized version of it. Just received this. I am in love. The extras that come with this are amazing. I legit am happy I bought this. I needed this series on DVD or Blu-ray for a while now anyway. Well worth it! Finally after 10 year, a proper 00 gundam release! 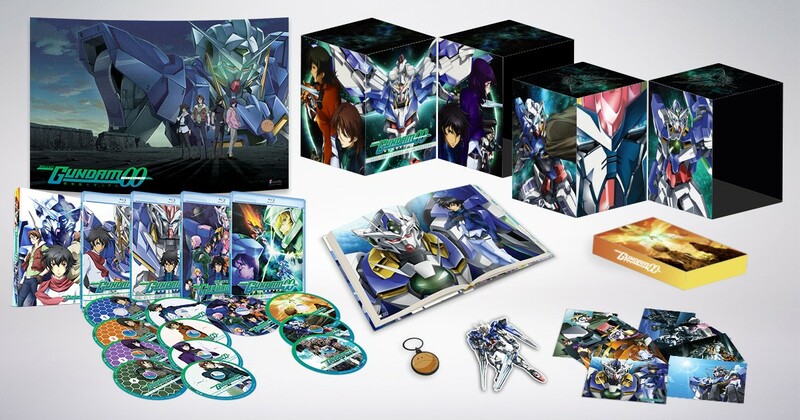 Definitely worth getting, gundam 00 is my top favorite gundam series. And this ultimate edition has all the sets plus extras. Although I would've preferred a bigger book and box like gundam wing, this is definitely still a good set to have. They packaged the anime really good. The only griefs I have is: The OVA never got dubbed. The menu page has zero sound (I am use to it having background music). Other than those two things, I am quite pleased. I've been trying to get the entire collection for years. Some parts are extremely expensive. I rather pay this price for Season 1, 2, Movie and OVA than that price on one season (the problem I was facing). This is one of my favorite Gundams. This set is fantastic! I admit that gundam 00 is my favorite gundam series of all time but I'm not baised about this set. I bought the gundam wing ultra edition on amazon and it was fantastic... But it was also unnecessarily large. Gundam 00 ultra edition takes all that extra space away with a more compact look like the artbook without having to make it less pages although smaller compared to the massive one in the wing ultra edition. It also has art cards, which the previous edition had also. It does have a haro keychain and a exia fridge magnet in which the wing edition had pins and themed fortune telling cards which I honestly prefer over this. Also has a poster, in which the wing ultra edtion had 3 reverse posters. Has both seasons, the movie and ovas in 1080p english dubbed full screen, highly recommend. Recomend the upcoming G Gundam ultra edtion. Must have for any gundam lover. I'll start this off saying i love Gundam 00. Season 1 was amazing, Season 2 was good. Even if Gundam 00 isn't your favorite, this is worth the buy. Whenever someone tells me gundam is too daunting of a show to start, i let them know 00 is standalone and they need no previous knowledge of the series to watch it.